John Taylor (Clayne Crawford) is a criminal on the run after carrying out a bank robbery, but this isn’t his first run-in with the law. Injured and looking to get into more trouble, John goes door-to-door, hoping someone on a ritzy block will let him in. 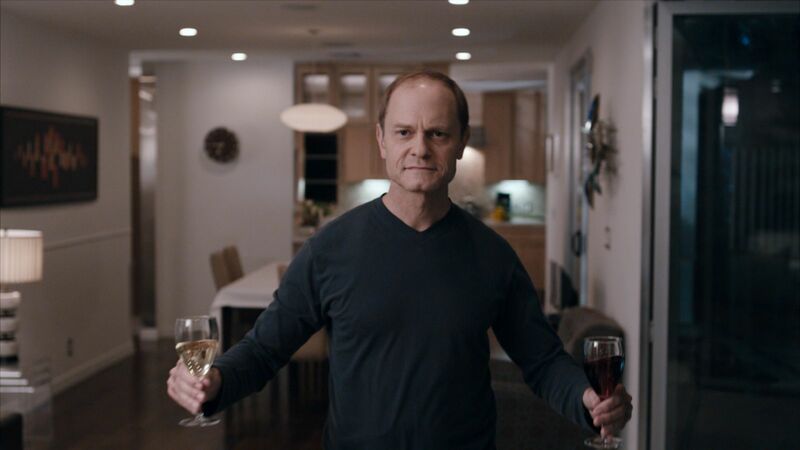 Finally, he succeeds in entering the home of Warwick Wilson (David Hyde Pierce), who is preparing for a dinner party. Warwick offers John red wine and the two share conversation. Warwick seems to buy into John’s “I’ve just returned from Australia, the airline lost my luggage and then I got mugged!” sob story. When the radio reveals that John is a criminal on the run, he quickly turns on Warwick, threatening to kill him. But little does he know, Warwick has more than a few quirks and twisted plans of his own. 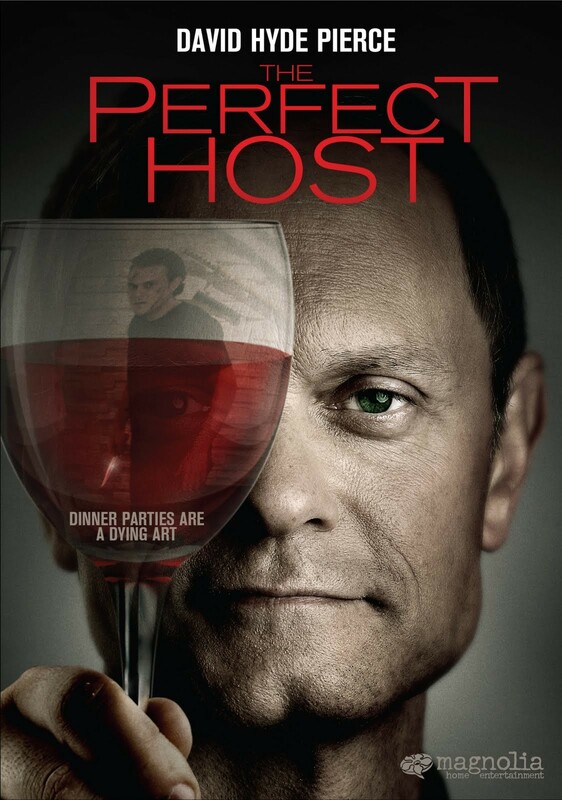 The Perfect Host is a 2010 dark comedy/thriller directed by Nick Tomnay, who also co-wrote the script along with Krishna Jones. The film, based on Tomnay and Jones’ 2001 short The Host, traveled the film festival circuit in 2010 and received a limited theatrical release in 2011. It was shot over the course of only seventeen days. The film is very well-written and comes off exactly as the writers seem to have intended it: a crazy, twisty horror-comedy. Unexpected turns are abundant here, which can make the film a bit puzzling but overall is very effective in entertaining the audience, especially those of us who have become disillusioned by all of the utterly predictable horror films of recent years. The best performance of the film comes from David Hyde Pierce, best known for his portrayal of Niles Crane on the long-running television comedy Frasier. In the beginning of the film, the viewer is never quite sure whether his character of Warwick is simply a man of many quirks or a true creep. As the film progresses, it becomes clear that he is, in fact, highly deranged. Pierce’s pitch-perfect performance in this role lends both suspense and hilarity to the film. He also manages to evoke a bit of sympathy for his character, giving the story an underlying sadness due to the degree of Warwick’s mental instability. The story gets wrapped up with a great ending that doesn’t come close to answering all of the viewer’s questions. It’s one of the best dark comedies I’ve seen in years – a solid, elaborately woven tale that easily outshines today’s major horror releases. The film is still available on Netflix Instant for your viewing pleasure, as well as on DVD and Blu-ray. Looks very intriguing…perhaps better than Shutter Island? I don’t think the two are comparable. I probably enjoyed watching The Perfect Host more since it’s such an odd mix of crime, horror and comedy, but my first viewing of Shutter Island was highly suspenseful. Both films are great in my book, for different reasons. Thanks for reading!